Well there is no wonder this book became very popular in a short time. It’s a wonderful book to read with lessons in communication and marketing that put immediate changes into your way of thinking about your influence in what you write and say. 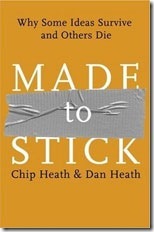 The brothers, Dan and Chip Heath have put a set of studies on communication and human nature to the test and drawn not only useful, but easy to absorb and apply steps to make your ideas that you present to others more “sticky”. That is to say, they will be remembered, have more impact and increase the chance of causing lasting change. The concepts written about in the book are applied beautifully by example in the title and cover as well as the duct tape patch job has actually been embossed out on the books cover. A brilliant idea that ensures the title of the book at first glace will even stick in your mind. While the book might seem from the topic to fit only the presenting, marketing or sales type of roles and personalities, it is certainly not limited to those groups of people. It is an entertaining book that will enable anyone to share their ideas more effectively and to explore the reasons that an idea will last, whether that is in a story you tell, or an idea you have to share. It will definitely transform your thinking when it comes to your communication and it will engage your mind on simple principles that will enable you to have more winning ideas applied in a way so your message will stick! Many stories are used as evidence and they include urban legends, low-fare airlines, mission to the moon, soap operas, genetics, Disney, nuclear war, classic tests, famous people, state missions, fast food diets, smoking and many many other topics demonstrating brilliantly the sticky ideas that worked in each. They prove these principles and clearly demonstrate why they are so memorable and effective. The authors make real these concepts by stories as example, but they also explore data from studies and surveys in many areas as evidence as well. They do this the whole way through with a touch of humor, easy reading, valuable topics and making what could be made very complex, quite simple. I love how they show so well in their writing exactly it is that they are in fact, writing about and the book is one you will remember, the concepts live on with techniques to apply them and I’m sure you would enjoy the book if you have any interest in it’s message at all. Like any book, it is only as useful as you take application of it. I did however, find there is much more applicable content and guides from Made to Stick than there was in similar books like the Tipping Point or Blink . You can grab a bunch of free outlines and content by the authors here . It’s good content and quite useful whether you’ve read the book or not, so do check that out! Now you really made me curious, I’ll jump on this one as soon as I can. Think I might find that useful now. I’ve read The Tipping Point and found that interesting. Hi Mike, another great book I think. I like the point of ‘S.U.C.C.E.S.S’. I’ll check it out in a bookstore. Nice review. Your review makes me want to pick the book back up and give it another try. The first attempt was unsuccessful as I did not find the book very interesting. Ifeel the unbearable desire to get this book and read it right now.The structure of the book looks very interesting and the authors are introduced as remarkable personalities.I will follow your recommendations. I agree that this is a terrific book; quick reading, well researched yet not tiresome in its details or statistics. As a teacher, I definitely see value in the six “sticky” factors which the brothers mention, and I’ve even adapted the ideas for a teacher training workshop I present (and a blog) called “Teaching that Sticks.” If you’re a homeschool parent, teacher, or trainer, take the opportunity to see how teachers are putting the sticky ideas to work at http://teachingthatsticks.blogspot.com. LearnThis is authored by Mike King. Mike is a passionate learner and loves to help others learn more about self improvement, personal productivity, career, leadership and other life improvement tips.